Tag line: "They wait... They hunt... They feed"
Released in 2008, The Burrowers is an exceptional creature feature, with underground monsters that finish off their victims in a most unusual way. 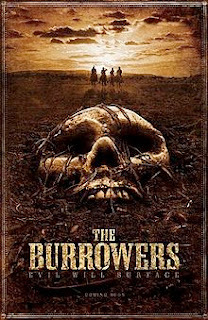 But The Burrowers is also a very well-made western, following a group of cowboys as they attempt to find a family that’s been taken from their home. It’s an excellent blending of the two genres, resulting in a rare horror film that’s just as interesting when its monsters are off-screen. We travel back to 1879, to an area that, at the time, was known as the Dakota Territories. Farmhand Fergus Coffey (Karl Geary) has been courting Maryanne Stewart (Jocelin Donahue) for several months. The day he’s ready to ask her father for her hand in marriage, he visits the Stewart homestead, only to find that the entire family has vanished into thin air. Making matters worse is the fact that the Stewart’s closest neighbors have been murdered in cold blood, each with a mysterious wound on their neck. Believing that Maryanne and the others were kidnapped by a hostile Native American tribe, Coffey teams up with his bosses, John Clay (Clancy Brown) and William Parcher (William Mapother), who, along with a cavalry troop led by the abrasive Capt. Henry Victor (Doug Hutchison), set off to find the Stewarts before it’s too late. But as their rescue mission stretches into days, Coffey, Clay, and Parcher make a startling discovery: a woman, buried alive but in a comatose state, who bears the same wound on her neck as the other victims. All at once, these cowboys realize they’re dealing with something they’ve never seen before, and may require some outside help to solve this perplexing mystery. I do love me a good western, and for the first hour or so (save a couple scenes), that’s exactly what The Burrowers is. In fact, the initial two-thirds of the film have more in common with John Ford’s The Searchers than they do any modern monster movie (like Ford’s classic, a team of rugged cowboys hit the open trail to find the tribe that’s kidnapped a loved one). John Clancy and William Mapother do an outstanding job as the experienced ranchers who, over the years, have been on an expedition or two just like this one, and Doug Hutchison delivers a fine performance as the bigoted Cavalry officer who’d sooner hang an Indian than question him (Victor and his men torture the lone Native American they take into custody). Shot on-location in New Mexico and featuring a handful of exciting shootouts, The Burrowers looks and feels like an authentic western movie. It’s so convincing that, for a time, you forget you’re watching a monster flick. That changes, however, once the last act rolls around, at which point we finally see the creatures causing all the chaos. To director Petty’s credit, he relied on practical effects (as opposed to CG) to bring these monsters to life, and as a result, they look pretty damn menacing (and what they do to their victims is truly chilling). While I personally enjoyed the western scenes, they may move a bit too slowly for die-hard horror fans, some of whom might lose patience with the film. My advice to them is to hang in there, because the payoff is well worth the wait!